Shipping and delivery info: 24" x 24" size ships UPS. Other sizes ship Freight. 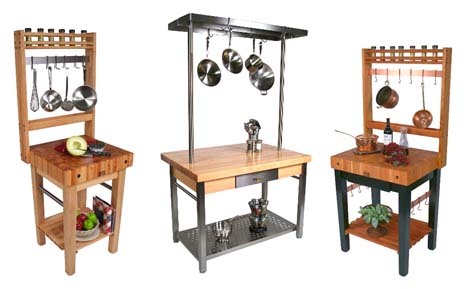 4 sizes: 24" x 24", 30" x 24", 30" x 30", 36" x 24"
Add function, style and sophistication to your kitchen to enrich your overall culinary experience. 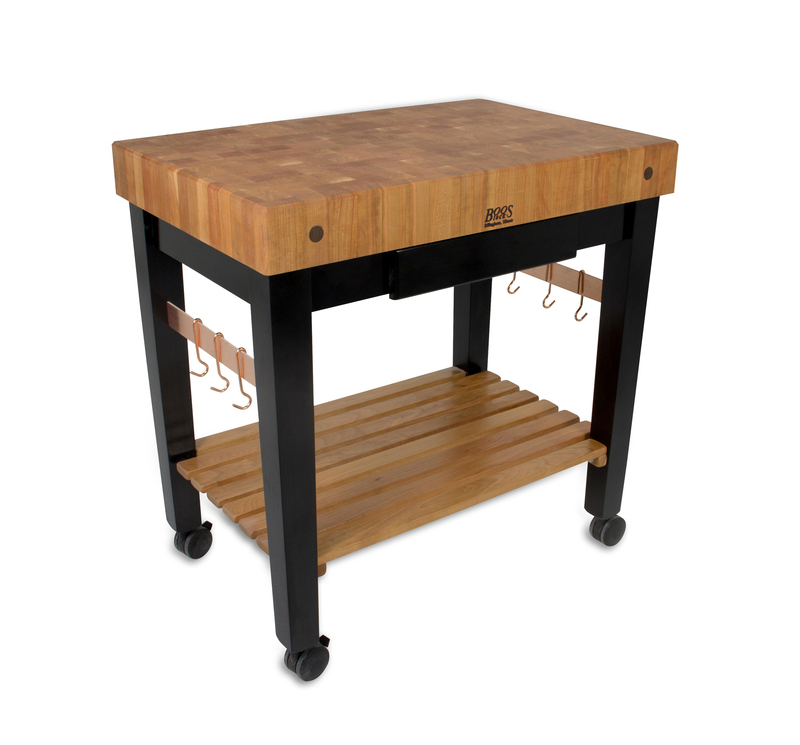 The Pro Prep Bloc features a gorgeous cherry top and slatted shelf contrasted with a black painted base. It comes in four different sizes: 24” and 30” squares, and rectangles measuring 30” or 36” x 24”W (deep). Included are two flat copper tie bars (and 6 copper pot hooks) that span the sides of the base and round out the visual feast. 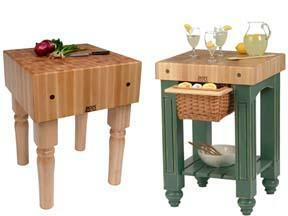 They’re perfect for hanging dish or decorative towels or for storing utensils or small pots and pans. 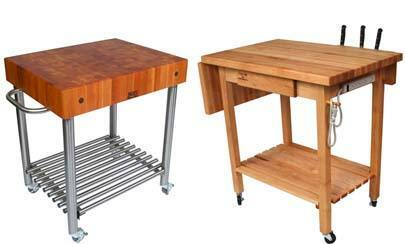 Further enhance your customized Bloc by adding an optional pot rack, a utensil drawer and/or caster wheels. 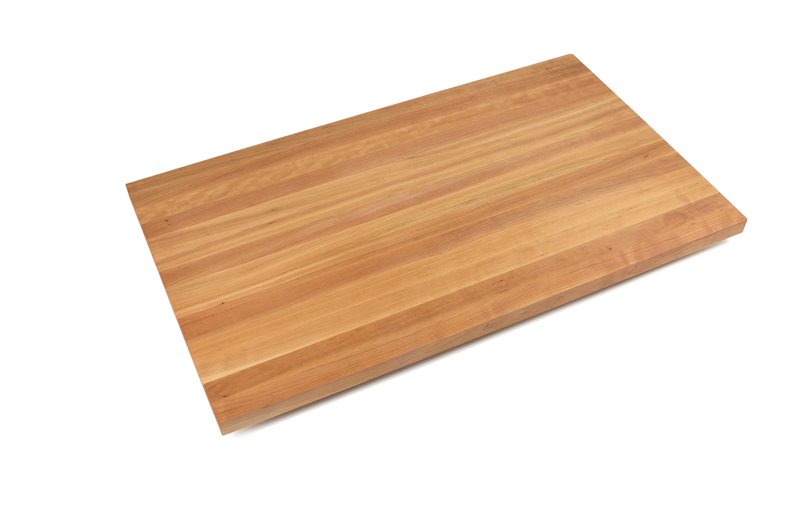 Its checkerboard-like surface shows off the natural beauty and variety of cherry wood end pieces and at the same time provides a resilient surface for serious cutting and chopping. That’s because knife blades actually slice in between the wood fibers that comprise the block’s surface. 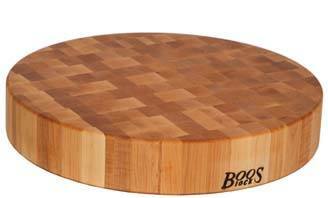 This helps prevent knives from dulling and keeps the wood from showing mars and gouges. 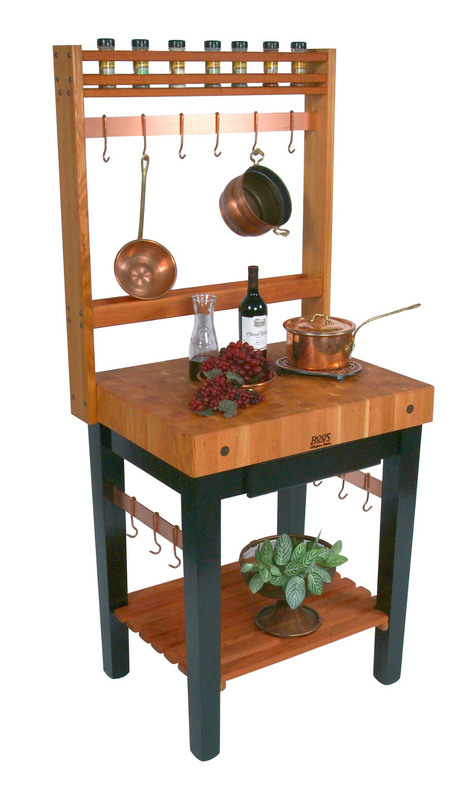 The optional cherry pot rack, which takes overall height of the unit to 70”, comes with a built-in spice rack up top and another flat copper tie bar from which you can hang pots, pans and utensils to create the ultimate kitchen work station. It’s a nice, functional complement to the slatted shelf that’s perfect for cook books and mixing bowls, among other odds and ends. 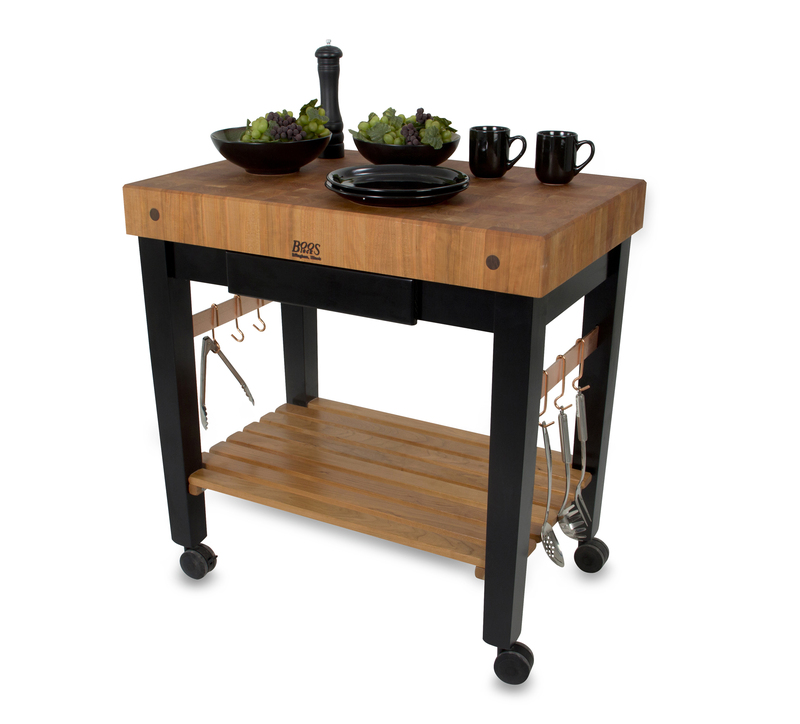 If you could use even more storage space, add a black-faced utensil drawer (not available for 24" x 24" size). 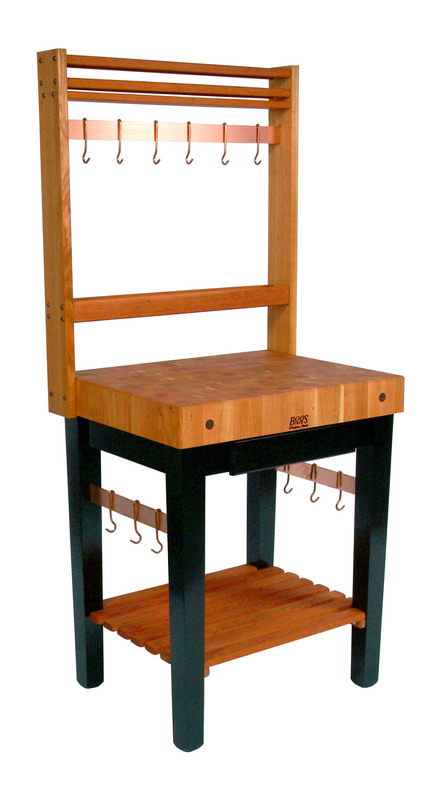 It’s perfect for storing items you’d like to have close at hand, like utensils or recipe cards. Finally, if you’d like to get the most out of your Boos Block, add 3" locking wheels to convert it to a mobile work station. This cream contains natural beeswax as well as mineral oil, enhancing its ability to replenish moisture and lock it in. We recommend that you reapply Boos branded oil or cream every 3 to 4 weeks to protect, preserve and prolong the life of your investment.